Ben Goldacre, author of Bad Science, is one of several authors of a British cabinet paper examining the concept of putting government policy to random controlled trials – similar to the way that medical treatments are tested. You can read his introduction on badscience.net and their cabinet paper, Test, Learn, Adapt: Developing Public Policy with Randomised Controlled Trials, from British cabinet office website. 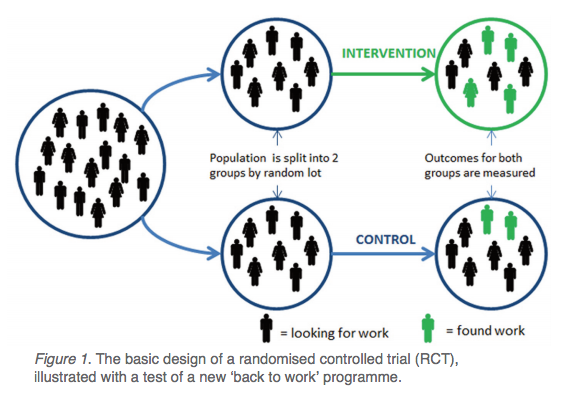 One of the key ways medical treatments are tested are via random controlled trials (RCTs); loosely-speaking, splitting the subjects into those with the treatment and those without and comparing the results of the two groups. Their cabinet paper outlines this process and talks about how it might be applied to government policy, including examples. The underlying point is that government policy could be subjected to the same sort of testing as used in other policy areas. It’s an interesting idea. Personally, I’d want to also see policy made using evidence-based decisions in the first place. Not much point in setting up policies that already available evidence suggests are unlikely to improve the situation. I Also can’t help but think there might be political resistance, one perhaps being getting some politicians to be precise about what the policies are to achieve! 1. Ideally these are double-blinded, i.e. DBRCTs, where the subject is not aware of if the they received the treatment or a placebo and the tester is not aware of which (group of) subjects received the treatment or not (or a placebo). In the case of policies, it’d be hard to hide who was under what policy. 2. In New Zealand some might point to ACT’s so-called ‘charter’ school policy in this respect as one example. Evidence-based policy is a nice idea. But politicians are less interested in policies which work, and more interested in policies which will appeal to their supporters, and voters at the next election. A point there, though: if you encourage people to look at the evidential support for policies, you get the impression they tend to comment on that. The folic acid supplementation issue, for example, is not a bad example. Peter Dearden has raised a similar case for growing GM crops.